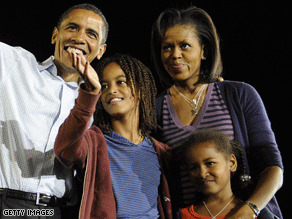 Obama was unhappy with negative remarks made about his wife during the campaign. (CNN) - Looking back at his two-year marathon for the presidency, Barack Obama told CBS he was most angered by "right-wing" attacks on his wife, Michelle, and said many of them were "completely out of bounds." "I do believe there is a Republican or right-wing media outlet, or set of media outlets, that went after my wife for a while in a way that I thought was just completely out of bounds," Obama told CBS' Katie Couric in an interview that aired Monday morning. "Frankly, I would never have considered or expected my allies to do something comparable to the spouse of an opponent. I just feel like family are civilians." Mrs. Obama took particular heat from conservative circles for comments she made during the primary season, when she said that for the first time in her adult life "I am proud of my country because it feels like hope is finally making a comeback." Those comments were highlighted by several Republican state party chapters in an effort to paint the potential first lady as angry, leading the Democratic presidential nominee to call on them to "lay off my wife" in an ABC interview in May. Mrs. Obama was also been labeled "Obama's baby mama," by Fox News and "Mrs. Grievance" by the conservative National Review. Some conservative outlets also buzzed last summer about the possibility of a tape, which has never appeared, that showed her using the word "whitey" from the pulpit of Trinity United Church. The Obama campaign said Mrs. Obama had never uttered the word and that no tape existed. "I just feel like family are civilians, and they don't sign up for this stuff... They really should be bystanders in this process, even if they're campaigning for you," Obama told CBS in the interview that aired Monday. As long as Michelle is running around the country opening her mouth at rallies than she's fair game. Guess if hubby lose tomorrow than she would no longer be proud of our nation.